This week I've had the pleasure to meet (virtually) Tom, an electrical engineer specialized in SCADA. Tom developed an interesting software called "SCADA miner". Basically, the software automatically dig the available data from various sensors and cross check the information to spot actual or potential problems that might go unnoticed, "lost in the sea of other alarms and event codes" to use his words. When something goes wrong the software automatically send an email to the people included in a distribution mail list, alerting them. One of the advantage of the system is that no new, dedicated hardware is needed: the calculations are made by remote servers. In his blog you can find several real word examples, such as high main bearing temperature, met mast failure, wind vane misalignment and several others. SCADA is an acronym that stands for "Supervisory Control And Data Acquisition". It is a fundamental tool to monitor and control several parameters of the WTGs, and it’s usual to sell it together with the turbines. 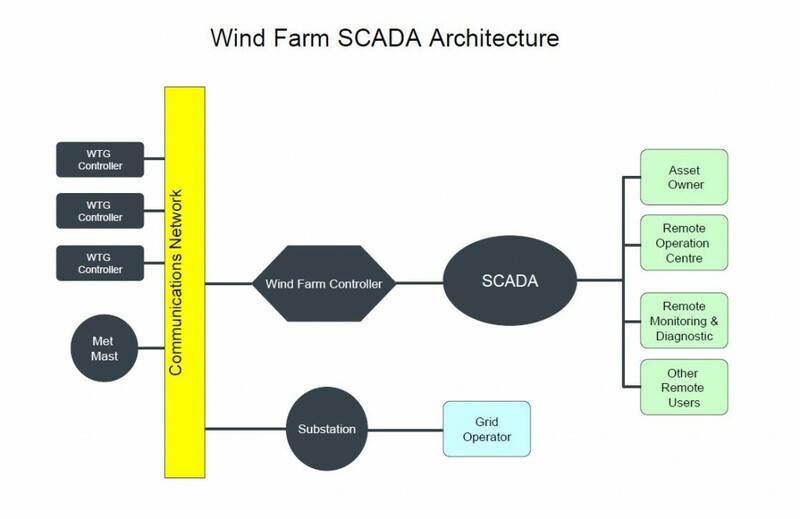 It allows combining, in a single point of control, all the info about WTGs, meteorological mast and substation, serving as the primary interface between the wind plant operator and the wind farm equipment, sending control signals from the wind plant operator to the wind park controller, retrieving and storing operational data from the WTGs and interrogating alarm signals. To integrate in a single system WTGs, substation and meteorological tower info. To allow an interrupted access to the data from the local PC (normally located in the substation building) and from remote computers. To allow to modify several parameters of the control system of the turbines. Each communication protocol used by a part of the system must be compatible with the others. WTGs: status (working, ready, paused, stopped), power (kW), cos j, speed (rotor, generator, wind), temperatures, voltage and current of each phase, active alarms. Met Mast: Wind speed and direction, temperature, pressure, battery status. Substation: Line voltage and current, active and reactive power delivered, status of alarms and protections. WTGs: start and stop of the WTG, use of the orientation system, transfer of production data. Substation: opening and closing the main switch. Several reports can be produced with the data provided by the SCADA system, such as determination of the power curve, generated power, availability of the turbine, failures statistics, wind data (speed and turbulence), active and reactive power and cos φ at the substation. Remote operation center: they must be able to use the alarm condition in a quick and efficient manner, discerning the root cause of a fault without being submerged by cascading alarms. Remote monitoring and diagnostic: after the first intervention from the remote operating center they must be able to interpret data quickly to solve the problem. Additionally historical SCADA data can be used to validate computational models or develop new models. Asset owners: they will use SCADA output for power revenue calculation, calculation of lost energy, etc.